We believe that the best way to integrate into the society and the student life in Weimar is to become friends with local students. At the same time we want international and German students who live in Weimar to meet people and explore cultures. Therefore we developed the Buddy Programme to connect new international students with students in Weimar to enhance the exchange of culture, ideas, opinions and lifestyles and make everyone feel welcomed in Weimar. Buddies will be matched regarding their personal interests. Once you got your buddy, you decide yourself how you spend your time together and how often you meet. Be curious who you match is! It's also a great opportunity to get in touch with people you otherwise wouldn't have. In addition we offer regular meetings and trips where you can get to know other Buddies as well. Weimar is a very family friendly city. Arriving with kids and not knowing anyone can be difficult though sometimes: We now also have the option to be specially matched with a buddy with kid(s)! We figured that students with kids often have slightly different needs and interests and need additional information to the life in Weimar with kids. 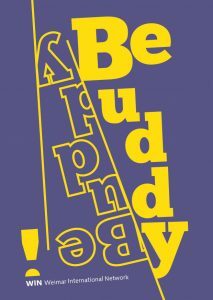 If you have kids you have the opportunity to be part of the Buddy Program with Child. Read more about it here. We are constantly looking for students of Bauhaus University, regardless of their nationality to join. Please contact us if you have any further questions. What is the role of a Welcome Buddy? An Welcome Buddy is someone who has studied at least one semester in Weimar already and wants to welcome a new international Buddy and is there for any questions before and during the stay of his or her Buddy in Weimar. You will be a big help for your buddy to get started in a new new city in a new country. If you are from abroad as well and had to settle in Weimar in the past or you are from Germany and have been abroad, then you know what it means to arrive to a foreign city. In exchange you will gain a friend and experiences which will prepare you for any stay abroad you might do in the future. Whether it is only for a couple quick questions, a coffee, a get-together or a long lasting friendship, that's up to you! What is an Income Buddy? Any internationals student who will study the following semester in Weimar or just arrived a few weeks ago can registrar as an Income Buddy. We will try to find a Welcome Buddy for you who will help you getting around in Weimar. How do I become/find a buddy? Interested in becoming a buddy? Please fill out this registration form. We will then try to match you with a buddy as soon as possible and connect the two of you. We aim to exchange cultures and make Weimar their new home. If you are interested in a language exchange please find more information about the Tandem Programme.